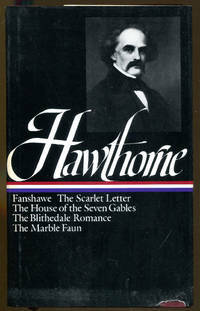 Novels - Fanshawe / The Scarlet Letter / The House of the Seven Gables / The Blithedale Romance / The Marble Faun. Novels: Fanshawe; The Scarlet Letter; The House of the Seven Gables; The Blithedale Romance; The Marble Faun. Library of America, 1983. Second printing. Fine in fine, faintly rubbed publisher's slipcase. Condition: Fine in fine, faintly rubbed publisher's slipcase. New York: Library of America, 1983. A compilation of all five of Hawthorne's novels, covering in fictional forms such issues as the Salem witchcraft trials, adultery and community laws, romance, utopianism, mysteries of identity, murder, much more. Hardcover with dust jacket, contains chronological and textual notes, 1,272pp. A very nice copy, the jacket in a protective cover, tasseled, and with the usual ex-lib markings.. Sixth Printing. Hard Cover. Near Fine/Near Fine. 8vo - over 7¾" - 9¾" tall. Ex-Library. New York: Library of America. Fine copy in slipcase. 1983. 2nd prt.. hardcover. 8vo, 1272 pp., The Library of America, vol. 10, Includes Fanshawe, The Scarlet Letter, The House of the Seven Gables, The Blithedale Romance & The Marble Faun. .
New York: Library of America. Very Good. 1983. Boxed. 0940450089 . In VG slipcase. ; 8vo 8" - 9" tall; 1272 pages . NY: The Library of America. VG. 1983. 5th Printing. Hardcover. Fifth printing bound in maroon cloth with ribbon marker. A very good c opy in a very good dust jacket. The book's front cover has a slight li ft. Some dust spotting to the edges of the page block. The dust jacket has a 1" long chip at the front panel's lower right corner. Mild tann ing to its spine. Contains "The Scarlet Letter", "The House of the Sev en Gables", "Fanshawe", "The Blithedale Romance" and "The Marble Faun" . .